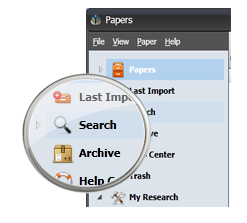 You can search your favorite repositories right from within Papers, and import articles directly to your library. In addition to this, you can save searches and perform the same search again to get the most up to date articles at a later time. Click on the Search link in the source list to the left of your screen. A list of repositories will appear, and you can select the one you would like to use for your search. You can search in any of these repositories at any point in time, so you can always use a mix of these for different searches. Once you select a repository, you can enter a search term in the search bar. Hit enter, and your search term changes into a search token, which you can now click and specify as being part of the title, keywords, authors list, etc. Set a combination of keywords or author names and Papers helps you find what you need, fast. When you are finished entering search terms, just click on the search icon to complete your search.